Philadelphia and Wayne,PA restorative dentist, Dr. Vito, is a graduate of the prestigious Periodontal Prosthesis Program at the University of Pennsylvania School of Dental Medicine where he received extensive training and certification in the diagnosis and treatment of broken, decayed and missing teeth. Dr. Vito has been doing adult, full mouth reconstructive, and advanced restorative dentistry since 1987. Dr. Vito works with a dental ceramist in his office to ensure the best fitting and aesthetic restorations. A dental crown is a tooth-shaped “cap” that is placed over the prepared tooth to restore its original shape and size, strength, and improve its appearance. The crown, when cemented into place, fully encases the entire visible portion of a tooth that lies at and below the gum line making it virtually undetectable form the surrounding teeth. Crowns are typically used to restore a tooth’s contours, function and aesthetics following a procedure such as a root canal or when decay in a tooth has become so advanced that large portions of the tooth must be removed and can not be restored with conventional fillings or if a tooth is cracked or fractured. Dental crowns, when done correctly, provide many years of service, are virtually undetectable and represent the ultimate in dental restorations and prosthodontics. Porcelain crowns are recommended for aesthetic restorative work of the upper and/or lower front teeth. The use of porcelain material allows for a more natural appearance and when there is low functional demands. Porcelain fused to gold crowns are for areas with moderate to high functional demands like posterior teeth which are subjective to high compressive forces. NOTE: Some offices utilize economic base metals rather than gold. The disadvantage of the base metal is that they will begin to tarnish and corrode after a short period of time. This will result in poor tissue health which may lead to bone loss and tooth decay. The base metals will not give the true color of porcelain selected for your crown restoration and results in a less than natural appearance. All porcelain crowns are composed of 100% porcelain. They are used in areas of low function demand (non- clencher and grinders) and high aesthetic requirements. A dental bridge is used to bridge the gap created by one or more missing teeth. It is made up of a series of crowns joined together as one piece and supported by teeth or either side of the gap or space. The bridges are supported by either natural teeth or implants. Dental Bridgework is a natural-looking dental appliance that can replace a section of missing teeth or all the teeth in the upper or lower jaw. When all the teeth in both the upper and lower jaw are crowned this would be referred to as a full mouth reconstruction. 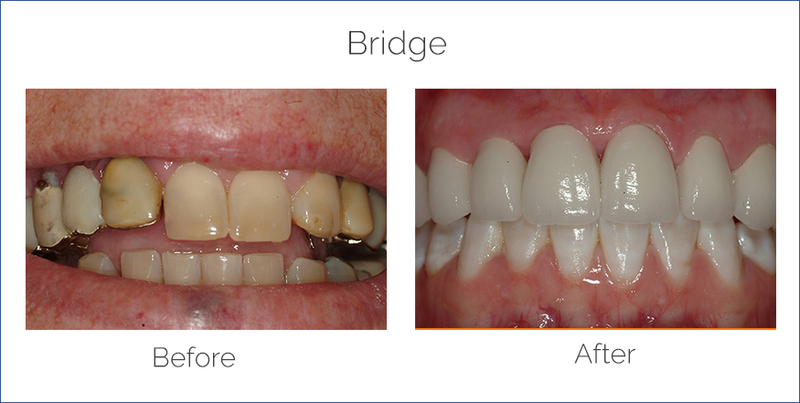 Since bridgework is custom-made, they can restore the natural aesthetics, contour and function of teeth as well as the proper bite relationship between upper and lower teeth. Bridges are sometimes referred to as fixed partial dentures. Bridgework can be fabricated with porcelain, gold alloys or a combination of both materials depending upon the span of the bridge as well as the functional demands of the bridge. A tooth must usually be reduced in size to accommodate a crown fitting over the tooth and not affecting the bite. Following tooth preparation an impression is made. The impression is sent to Dr. Vito’s lab who then manufactures a custom-designed crown. In aesthetic cases, the dental ceramist comes to Dr. Vito’s office and spends time with the patient ensuring the proper color and aesthetics to the patient’s satisfaction prior to permanently cementing the crown or crowns in place. With proper hygiene care, a good quality crown can service you many years. It is very important to care for your crowns in the same way you would care for your teeth taking care to avoid excess plaque or collection of debris around both your teeth and crowns. Certain behaviors such as jaw clenching or bruxism (teeth grinding) significantly shorten the life of a crown. Moreover eating brittle foods, ice or hard candy can compromise the adhesion of the crown, or even damage the it. If you display evidence of grinding, Dr. Vito may suggest a “bite guard” to protect your teeth and restorations. Dr. Vito will examine the area where the bridgework is necessary, take X-rays and make up casts of the teeth. After aestheticizing the area the teeth are prepared. When the preparation is complete, an (impression) of the prepared teeth is then taken. A temporary restoration is made. The impression/mold is sent to our dental laboratory, where Dr. Vito’s lab technician uses it to fabricae the bridge restoration. Depending upon the complexity of the bridge,several fitting appointments may be necessary to ensure the proper fit of the final restoration. Once the fit of the final bridgework is confirmed by clinical exam and xrays the bridgework is cemented in place. There are practical reasons for both procedures. Dental implants replace just the individual tooth for a result that is deemed stronger and permanent. A dental bridge may be your best option if the neighboring teeth have large fillings and need crowns or caps in the future or if a patient does not want to do any procedures to improve the bone or soft tissue in the area. Dr. Vito will review what is the best solution for you based upon your specific situation and your preferences. 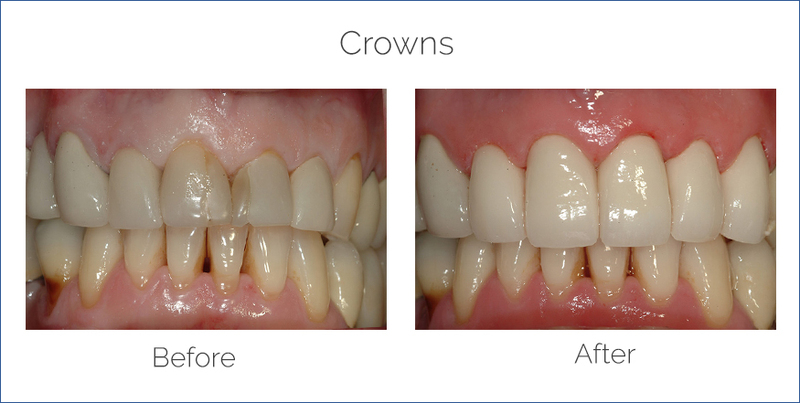 A crown protects and covers the whole tooth to restore the entire shape, function, color and strength of the tooth. A veneers is a a porcelain shell that is placed on the front of the tooth. It is design to repair minor flaws, gaps and changes in color. Its purpose is to improve cosmetics. Visit our Dr. James Vito’s Cosmetic and Restorative practice in the Philadelphia area on the Main Line today (610) 971-2590.